Finally some cold weather! I've honestly been eager for the temperatures to drop just to give me an excuse to bring out my floppy hat and knee high leather boots. Who doesn't love winter outfits? I went for another super simple look: black leggings, a neutral sweater, and accessorized with the leopard print and floppy hat. I've always liked how hats look on people, just never pictured myself wearing them. When styling my outfits, I tend to focus on the clothes and shoes, and kind of forget about the accessories. I've really been trying to put more emphasis on the jewelry, scarfs hats, and bags lately. After all, that is what ultimately completes a look and transforms it from simple to chic. So Beautiful. Love your hat! You look smashing; loving the hat and your sweater! Beautiful hat and scarf dear! Love your blog, would you like to follow each other? I just found your blog and love your fashion. Have a floppy too... but I'm not sure if I can wear it - on you it looks great! hey dool. i am following now. you look ravishing by the way. Can you please tell me how you add the social media icons , just like you did under the "about me" section? 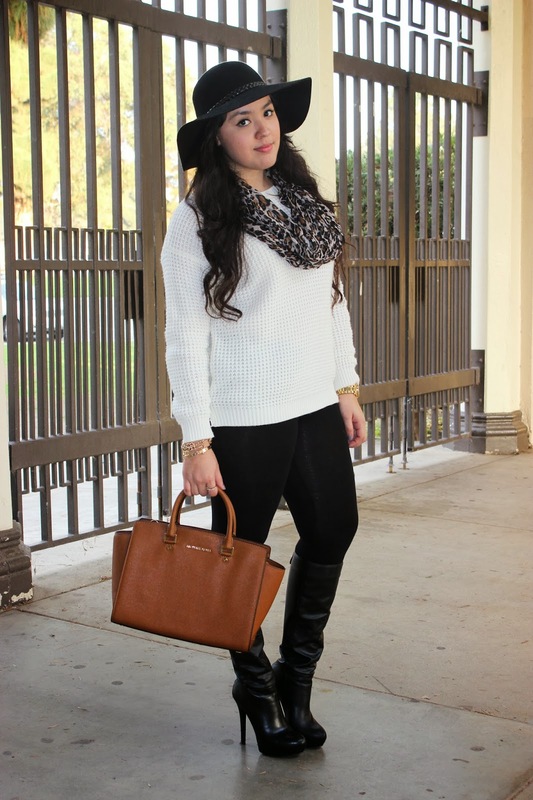 Great outfit, love your Selma! Thanks for visiting my blog, I follow you with pleasure ;)! 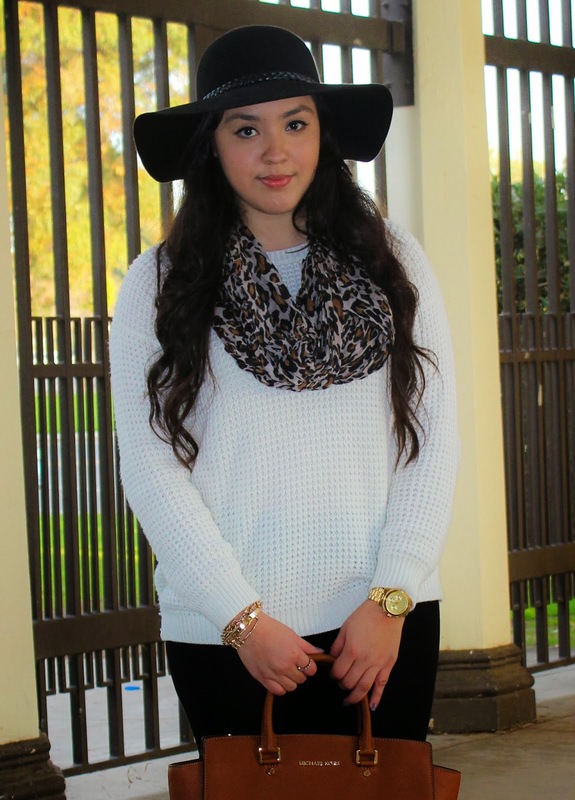 we love wide brimmed hats, you look so fabulous! 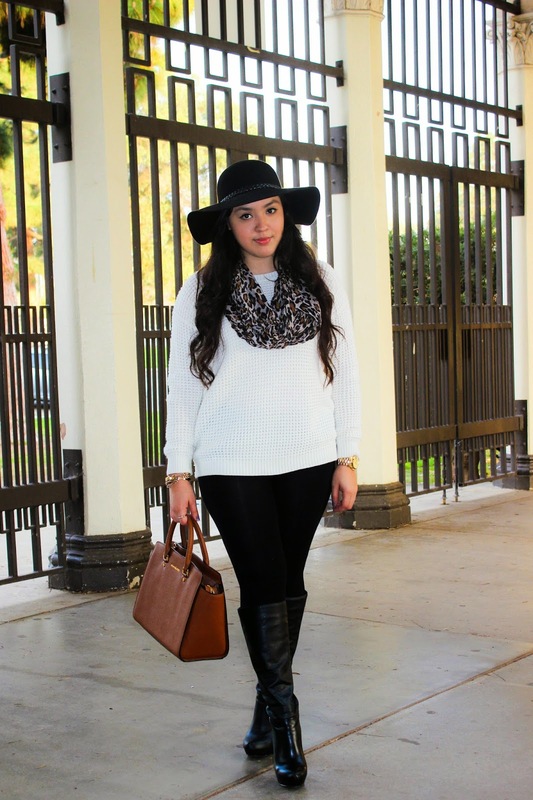 Love the styling of this chic outfit, the hat looks great! Great outfit! I love your bag! Just found your blog and really like it! Would you like to follow each other on GFC, Facebook or bloglovin to stay in touch? Let me know, thanks! You have a nice outfit there girl it really looks good on you! Gorgeous look! And these high heels are amazing!!! simple and nice look ! Love the hat, very stylish! You look great with your floppy hat! Love your outfit! The hat is gorgeous! Wow, fantastic! You are so gorgeous! Thank you for comment and follow my blog, of course I follow you back! Love the touch of the hat, is always a sweet detail. love it Elsa! that scarf really made the outfit. pretty hat and awesome scarf gf! your accessories are just all around great! follow each other here, on bloglovin or via GFC? Well, I guess great minds think alike, right? I've featured a similar hat in my latest post. You have an amazing style sense. I'm following now, I would be more than happy to see you on my list as well! I have been wanting a hate like this forever!! So cute, I love the whole look. I will definitely check it out and hope to find it! and thanks again for replying to me. Love your outfit especially that hat and scarf together. you got really nice blog,would you like to follow each other? Wow amazing outfit! Especially love that hat!